You don't have to add salt to food to be eating too much – 75% of the salt we eat is already in everyday foods such as bread, breakfast cereal and ready meals. A diet that is high in salt can cause raised blood pressure, which currently affects around one third of adults in the UK. High blood pressure often has no symptoms. But if you have it, you are more likely to develop heart disease or have a stroke. Right up to the 20th century, pound bars of salt (called amoleh) were the basic currency in Abyssinia (now called Ethiopia). 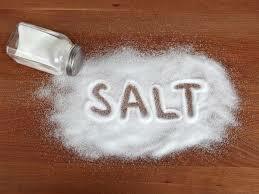 Greeks exchanged slaves for salt, therefore the expression “he is not worth his salt”. Napoleon’s troops died during his retreat from Russia, because their wounds did not heal as a result of a lack of salt. In medieval European times, Venice had a great economy through its salt monopoly. Salt played a key role in the history of West Africa, particularly during the great trading empire of Mali (13th – 16th centuries). In the 15th century, when European fishing fleets discovered the Great Banks of Newfoundland, they used the dry or shore salting method of drying their catch racks onshore. In ancient times salt was often called: “life-salt”, or “salt of the king”. British monarchs have long supported salt taxes and many were imprisoned for smuggling salt, even French kings developed a salt monopoly selling exclusive rights to a few who made salt very difficult to obtain. A significant cause of the French revolution was the salt tax La Gabelle. It increased over a period of eighty years about a hundred fold. December 1864 in the Civil War of the US, Union Forces fought a battle to capture Saltville Virginia, a site of a very important salt processing plant thought essential to sustaining the South Armies. In Tibet, tiny cakes of salt were pressed and used as coins. Roman Legionnaires were paid in salt (Salarium, the Latin origin of the word salary). Salt is still being used today as money in Ethiopia’s Nomads. In spiritual and religious practices salt was and still is regarded as incorruptible immutable purity. In 1933, the Dalai Lama was buried sitting up in a bed of salt. In Buddhist and western spiritual traditions, salt repels evil spirits. Shinto religion uses salt to purify an area. In spiritual tradition one uses salt to cleanse crystals of negative vibrations. In India, a gift of salt marks a potent symbol of good luck. The amazing Salar de Uyuni (the world’s largest salt flat at 4,000 square miles) in Bolivia becomes mirrorlike when a thin layer of water lies on top. This reflectivity makes it a very useful tool in calibration scientific equipment from outer space. This amazing salt flat also contains half of the world’s supply of lithium. Salt is so essential to the body that if you drink too much water it can flush it out of your system and cause fatal Hyponatremia. Consumption of too much salt can be deadly – you need to take about 1 gram of salt per kilogram of weight to die and this was used as a method of ritual suicide in China – especially amongst the nobility as salt was so expensive. Good quality sea salt contains many essential minerals for the body. The best type of sea salt should be slightly wet from the sea it was taken from. After aviation fuel is purified, salt is mixed with it to remove all traces of water before it can be used.